Fishing hot spots and hiring a fishing guide in Summit County. The 619 square miles of Summit County are an outdoor paradise, with an abundance of outdoor recreation areas surrounded by stunning scenery. This mountain playground is filled with creeks, rivers, lakes and ponds, ensuring that, no matter where you go in Summit County, you’ll find excellent fishing nearby. 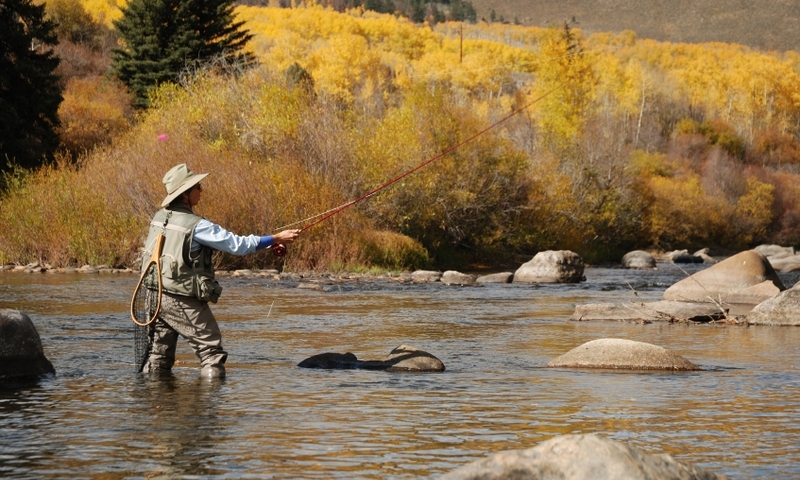 No matter what time of year you come, you’ll find excellent fishing in Summit County. While summers see the most insect hatches, falls are idyllic due to clear days and small crowds. In the winter, ice fishing takes off as lakes and reservoirs freeze (die-hards still head out to the tailwaters during the winter months). As days lengthen and begin to warm up, the waterways flourish back to life, attracting anglers from all over. Whether to Hire a Guide? While you shouldn’t have a problem finding places to fish on your own, a guide may be able to take you to some of those out-of-the-way hot spots that you won’t find alone if you only have a few days to spend exploring Summit County. Guided trips also have the advantage of already having boats and transportation taken care of. If you have a week or two to explore on your own, though, you may find some solo adventures to be more rewarding, even if you spend a bit more time looking for the best fishing. This gorgeous lake is a great place to go fishing with the whole family. Just 25 miles from Silverthorne, a half-mile hike will lead you to this mountain lake and views of Cataract Falls. From the lake, a two-mile trail winds around to the far end of the lake (the fishing is best at this end, especially during the evening hatches), where you’ll find the inlet of Cataract Creek. While you’ll catch numerous views of Cataract Falls during the walk around, caution is advised if you decide to approach the Falls themselves as the way up can be treacherous. Expect to find plenty of brown, brook and rainbow trout. Whether you choose to fish the Blue River above Breckenridge, where it’s little more than a large stream; below Lake Dillon, where fat trout feast on Mysis shrimp; or in the Gold Medal fishery sections around Silverthorne you’ll find great Colorado fishing with scenery to match. In the upper sections outside Breckenridge you’ll find some nice wadeable trout ponds that are great for beginners. The spots directly above and below Lake Dillon are both filled with lots of big trout, especially the tailwaters, where some monster trout can be seen. The lower section near Silverthorne usually draw more of a crowd, but with good reason, as the waters here offer excellent technical fly fishing with plenty of fish. If you visit Blue River, expect to catch brown, brook and rainbow trout. In the winter, parts of Blue River remain fishable and Lake Dillon is a popular spot for ice fishing. If the idea of possible crowds on the Blue River turns you away, cast your flies toward the Williams Fork, where you can bask in solitude while casting for small rainbow and brook trout. While you probably won’t pull in a lot of trophy fish in the upper sections, these are great waters for beginners to practice casting and pulling in some fish. The lower section has great fishing for larger trout, although you will to hike about 20 minutes before you can enjoy the surrounding aspens and grassy fields while casting. Be sure to check the water levels before you head this direction – during drought years the Williams Fork can run low and the fishing may suffer. This trio of lakes definitely delivers on the scenery – open meadows and towering mountains surround you in all directions. Luckily for anglers, they deliver on the fishing, as well. Despite their proximity, each lake can offer very different fishing on any given day. While the North Lake is the only one of the three that has been awarded Gold Medal Water status, don’t let that deter you from throwing a fly into all three lakes. You’ll find Delaney Buttes Lakes just north of Walden in North Park Colorado. If you don’t enjoy hiking, this may not be the place for you. But if you’re up for a good hike into a beautiful reservoir before casting a few flies, Clinton Gulch Reservoir could be for you. Once here, you’ll find plenty of good-sized cutthroat trout, few anglers and spectacular views of the surrounding mountains and forests. While this popular spot is great for pulling in rainbow and brown trout, if you’re looking for kokanee salmon Green Mountain Reservoir is an excellent choice. Easy to access and easy to cast into, you’ll find plenty of large fish here. During the winter, Green Mountain Reservoir is a common place to find anglers cutting holes for ice fishing. While these two spots technically aren’t in Summit County, they’re both close enough and are worth mentioning. Where Muddy Creek flows out of the Wolford Dam you’ll be able to find some very nice fishing minus the crowds that the more popular areas in Summit County are infested with. Unfortunately, if you come during mid-summer you may find this spot infested with flies instead. The very accessible Black Lakes are located near Copper Mountain. Try to pull in a few rainbows with attractor flies and panther martin spinners if you can pull your eyes away from the mountain views.